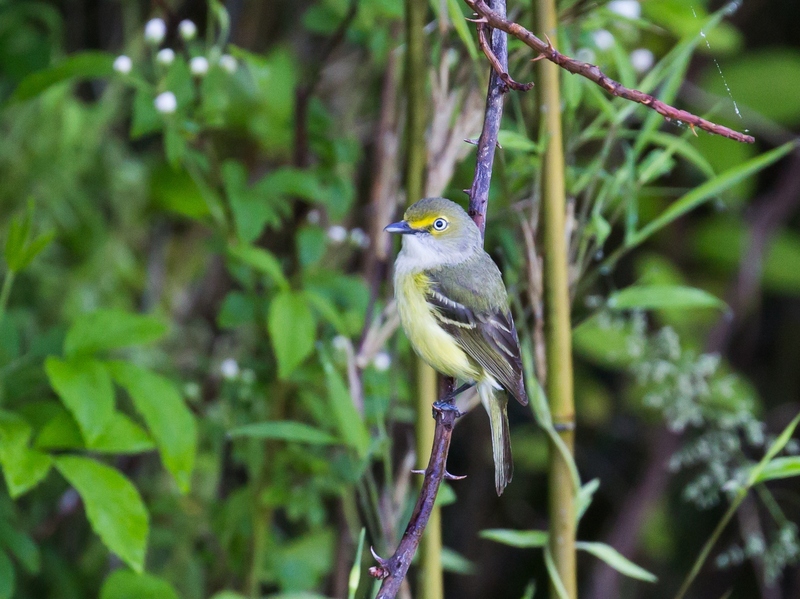 White-eyed Vireo. Photo by David Disher. Ann & Chester Robertson are beloved members of Forsyth Audubon and many of our members remember the warm welcome we received from Ann and Chester. On September 8, 2018, Ann wrote about their own introduction into Audubon. With a nod to Marcel Proust, it is the call of a White-eyed Vireo, not a scent, that has stimulated many memories of our first “birding fall,” which was exactly 20 years ago. When Chester retired from EMS, we had time to watch birds devour mulberries from the tree just outside our sun porch on the south side of town. [We’ve since moved mid-town.] That led to feeders, books, binoculars, and a budding interest in going abroad to search for more species. We checked out the then-new Bethabara wetlands boardwalk, where we ran into Marilyn and Mike Shuping. They kindly invited us to join the next 2nd Saturday Birdwalk, which was mid-September at Historic Bethabara. 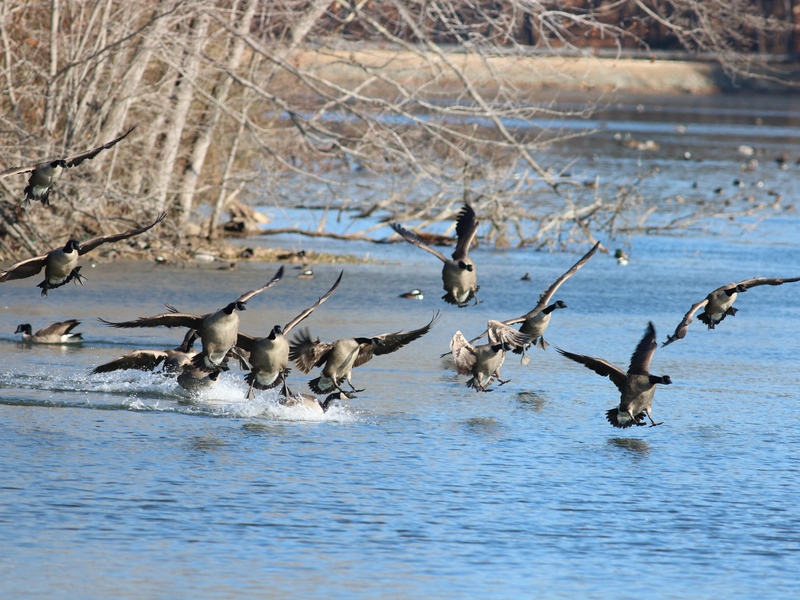 We well remember the anticipation and nerves as we waited with assembled birders. The walk began when Doug Deneve & Pam arrived. One of the highlights of the outing was seeing a White-eyed Vireo (new to us) foraging in low branches above the stream. We remember Doug saying it was a good find for that time of year. It was a while before that comment sank in, but eventually brands such as Leica, Swarovski, Zeiss and Bausch & Lomb made their way into our hands. And yes, we had better views, and much joy in sharing with our fellow birders, as well as casual strangers who might happen along and wonder what was up. One of my favorite memories was adjusting our spotting scope so that a handicapped child could look at birds on one of our outings. The child wanted to go to Africa to see birds; we always hoped that he made it. There are 20 years of great memories of time spent in the field, in meetings, and in social gatherings with the best group of people we could ever hope to know. We have learned that birds attract a very fine human flock indeed. We’re grateful to each of you who added to those memories over the years. We learned so much on outings that we could never absorb from books. As a small instance, I distinctly remember David Disher pointed out a “Thrush Burp” while we were one on of the middle trails in Miller Park. I always think of that moment when I heard another Thrush Burp. It may seem a small thing, but it provides pleasure and connection, and a sense of all being right with the world. May birders continue to share, may thrushes continue to burp, and raptors continue to thrill us with the spectacle of migration that points to forces well beyond our comprehension or control. And yes, may White-eyed Vireos continue to thrill us with just a little lingering lilt of summer. As you can imagine, the responses quickly started coming in. First from Phil Dickinson, a long-time FA member and past President who now lives in Washington State. 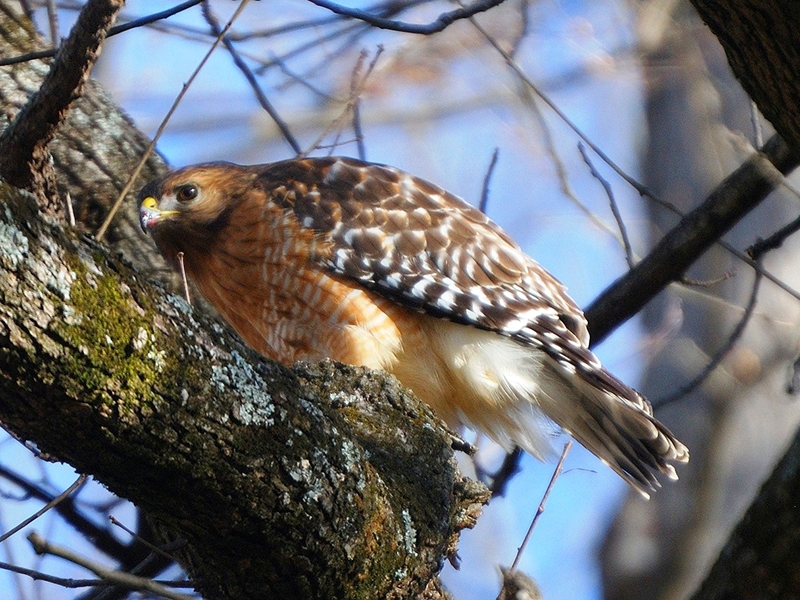 Ann, thanks for sharing these wonderful memories of birding with Forsyth Audubon. I am coming up on 20 years after my introduction to FA (98 or 99, I forget which), and I still remember the warm greetings I received from you and Ramona at that first meeting. From then on, I was hooked by the warblers and hawks, as well, and all of the great people. So many great spring and winter trips, too. I do miss those Broad-winged hawks out here, but love seeing the shorebird migration. And this from Sally Zwadyk. Dear Ann, Thank you for sharing memories. I have great memories of our time with you and Chester. Indeed birding does bring together a great human flock as well. Happy Birding Anniversary! Wendy “Big Bird” Hawkins, FA Education Chair, is a little newer to Forsyth Audubon, but now we can’t imagine life without her enthusiasm and passion for birds. Here’s what Wendy added to the conversation. How thrilling to hear these grand memories, highlighting, especially, your introduction to and connection with Forsyth Audubon! Although I am much newer to Forsyth Audubon (4 years) and to serious birding (having “evolved” largely over the past 10 years), I resonate in harmony with your sentiments. I have learned considerable volumes from my connection with the incredible characters which comprise Forsyth Audubon! Yet, I realize I am barely scratching the surface of all there is to know about birds! When I go birding with you all, I feel like a total kid, excited about everything I see — and I’ve been know to act like a kid, too, without restraint. And you guys still don’t think I’m TOO crazy! This fall will make 4 years since I met Kim Brand, as we were watching the same chimney at UNC School of the Arts (in our neighborhood at the time) while a few thousand Chimney Swifts assembled to roost for the night. I thought she might be a security guard approaching me to inquire about my presence in that spot, so I tried to look intently with great purpose, as if I KNEW what I was doing. How relieved I was when she joyfully asked, “Were you watching the Chimney Swifts, too?” “Yes!” I replied, “You were watching them, too?” Then she invited me to Bethabara (lower trails) — a place I had never been, but had been meaning to visit — to go birding with her early the next morning. Next thing you know I was also hooked on “Dead Bird Patrol” after she educated me on the Lights Out program and guided me in the rescue and release of a Wood Thrush on my first round with her. Thank you to all of my Forsyth Audubon friends for your enthusiastic comradeship! Rob Rogers, our favorite Forsyth Tech birding instructor and Forsyth Audubon past President jumped in next. And the rest….as they say….is history. Let’s end with Hop Hopkins, another beloved FA member and past President, taking us back FORTY years! Let me take you back 40 years instead. I came to Winston-Salem in 1977 to start my Pathology residency training at Baptist. I had always loved nature and decided to join the Audubon Society to get the magazine. A little later in the year I also received a newsletter for the Forsyth County AS. I had been birdwatching most of my life and I had never met another birder! The meeting sounded interesting so in 1978 I attended my first meeting. Like Rob I was shy and tried to sneak in but everyone was just too friendly. It was a small group who enjoyed birding together. 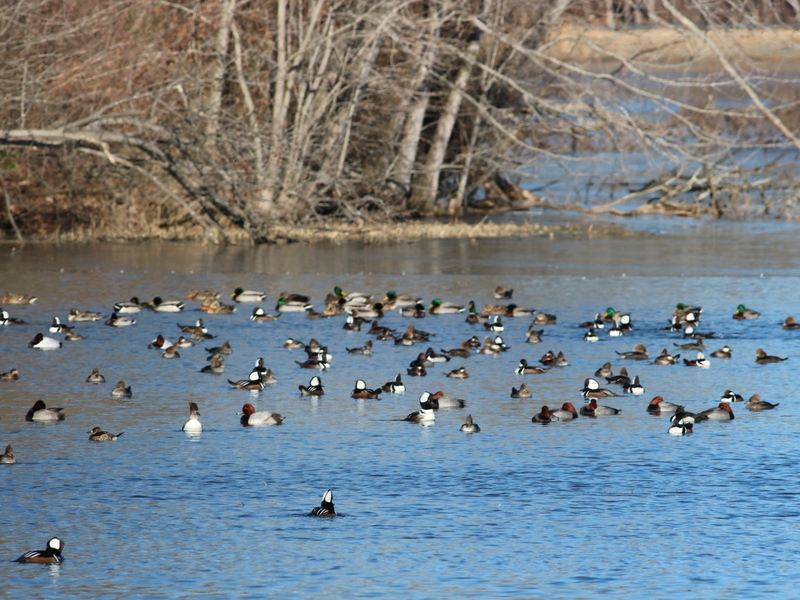 I was able to go on one of their local bird walks to Salem Lake and was amazed that ducks were this far inland. I had much to learn. I thought I knew my birds. Then Ramona assigned me to Pat Culbertson for Spring Bird Count. Since I always birdied on my own I thought it might be fun to learn other places to birdwatch in the county. I was surprised to learn that she planned to start at midnight to get owls and nighthawks. A front came in while we were birding so we rested a few hours at her house. At first light we headed out the door and she called out Swainson’s Thrush and Ovenbird. They would have been lifers for me but there was not enough light to see them. The day went just like that. Pat would hear 3 or 4 life birds but we had to move on as there was a fallout. The storm had brought in large numbers of migrants and she wanted all of them! I wound up being the recorder and I could barely keep up. I did get to see a few lifers, but until then I had no idea you could identify so many birds with sound only. I also had no idea where we were birding as we hit numerous places around the county. I think everyone at count dinner had a best day ever and the tally was massive. I had much to learn. I am still learning but I must say that my FCAS teachers have been outstanding. They taught me bird sounds and where to go locally. I even went on a few field trips to the NC coast to see birds. I had been isolated but was able to learn a great deal from FCAS. I am thankful that I attended that first meeting and hope to get back attending more of them. I hope you have enjoyed these stories. These shared experiences make Forsyth Audubon who we are. Please feel free to share your story in the comments. Since heading west to Washington in 2015, what I miss most in Winston-Salem is birding with good friends in places like Bethabara, Salem Lake and Archie Elledge. So, I was pleased when Shelley Rutkin expressed interest in visiting Mary and me and seeing some of our western species. We settled on late August as a time likely to produce good weather and some of Shelley’s target birds. Little did we realize just how exciting our bird search would become. Shelley’s late-night arrival called for a relaxed approach to bird finding on her first day. We headed to the Big Four Ice Caves about 45 minutes away in the national forest. It instantly became one of my favorite spots out here, and it was likely to produce a life bird for Shelley. Unseasonable heat kept the species count down. However, we were rewarded with good looks at several Black Swifts – Life Bird #1 for Shelley. 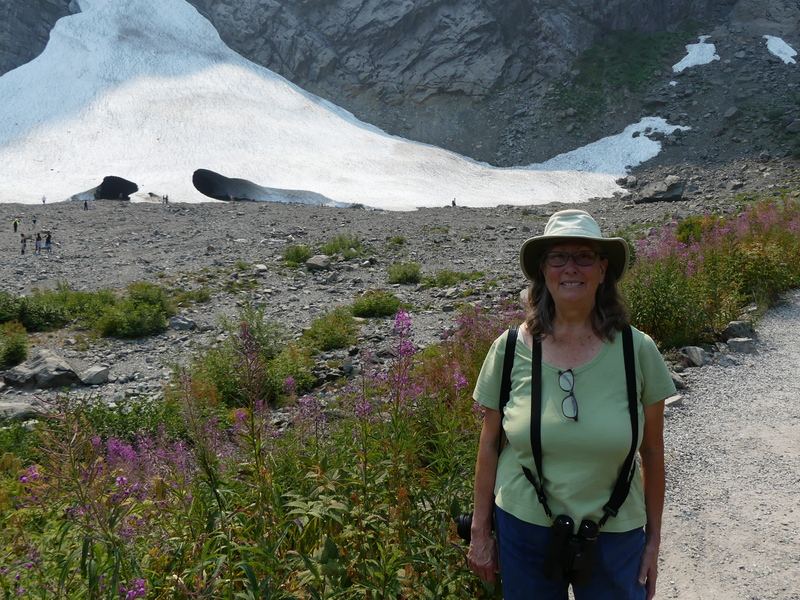 Shelley Rutkin finds Black Swifts at the Big Four Ice Caves. The next day, we headed to Mt. Rainier National Park about three hours away. 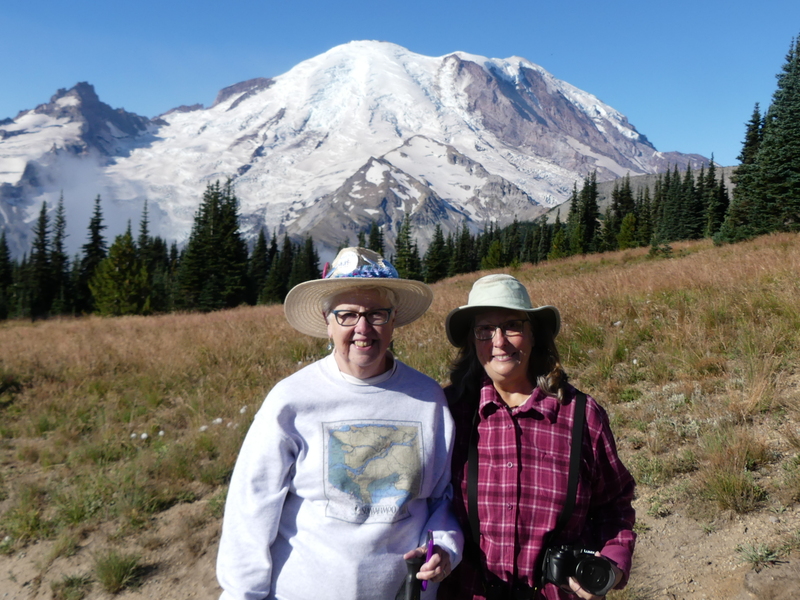 Mary and I have looked forward to going there ever since we arrived in the Seattle area, and it has some bird species that we do not see west of the Cascades. We stopped for a picnic lunch at the beautiful woods of Federation Forest State Park, where we saw our first Gray Jay of the trip. 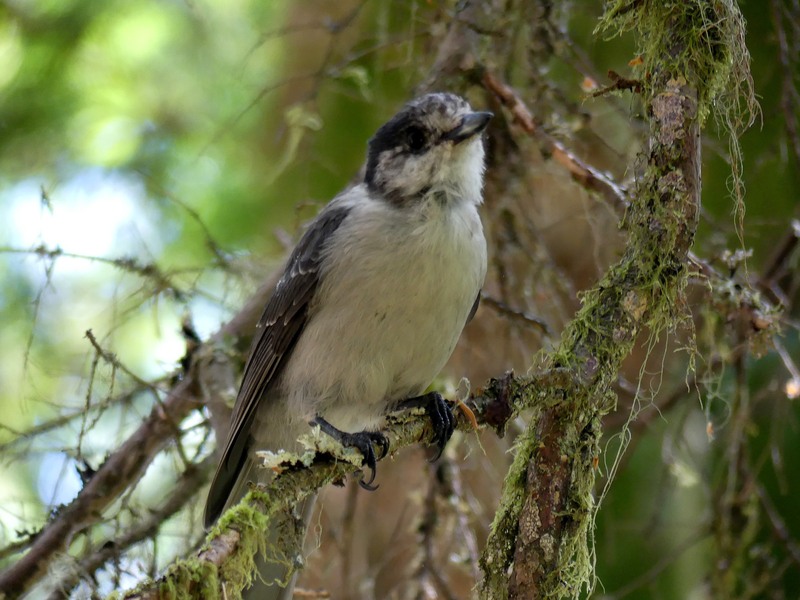 A Gray Jay was looking for a snack at Federation Forest. We arrived at our Crystal Mountain Resort lodgings by early afternoon, then drove to the park’s Sunrise Visitor’s Center. A Clark’s Nutcracker greeted us as we exited the car. A late afternoon walk along the Silver Forest Trail provided magnificent views of Mt. Rainier’s summit, Mt. Adams and the White River valley, along with sightings of Mountain Chickadees, Audubon’s Warblers and Common Ravens. Ominously, although it was clear above, we could see smoke plumes from nearby forest fires. The White River flows with glacial melt from Mt. Rainier. The next morning dawned bright and beautiful at the park. For our bird hike, we chose the Sourdough Ridge and connecting Mt. Fremont Trails. This route offered us the best opportunity for a Prairie Falcon and perhaps even some White-tailed Ptarmigans. At Frozen Lake, Mary headed back, but Shelley and I proceeded on our quest. Just as we turned the corner and headed up toward Mt. Fremont, we spied a pair of Mountain Bluebirds on a fence line. A pair of Mountain Bluebirds were hawking insects at Frozen Lake. “Moderate” soon became “strenuous,” at least in our minds, but there was no stopping us. We plunged ahead over treacherous scree toward the Mt. 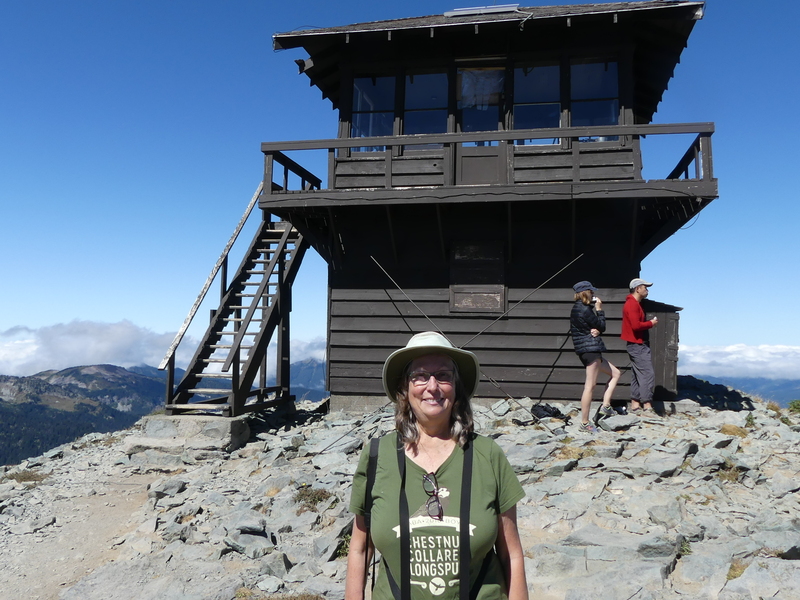 Fremont lookout tower. 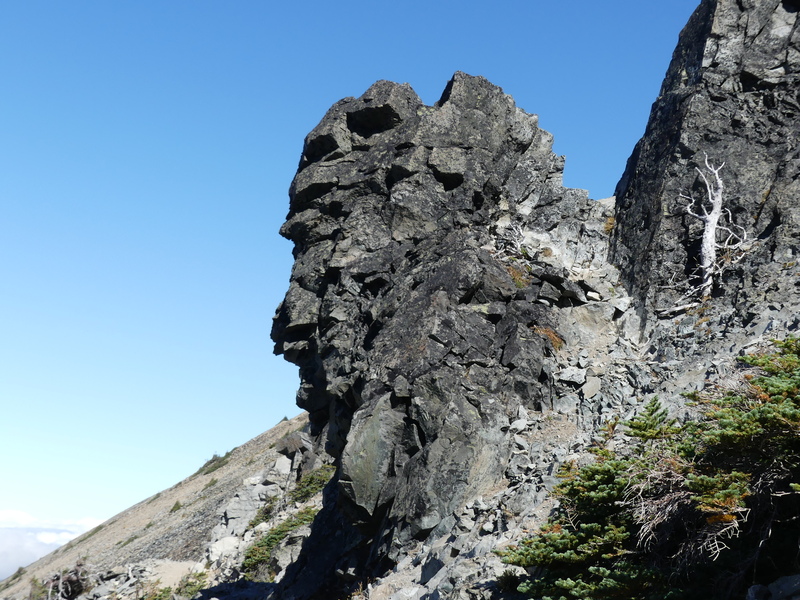 We hiked past this stone figurehead on the Mt. Fremont Trail. 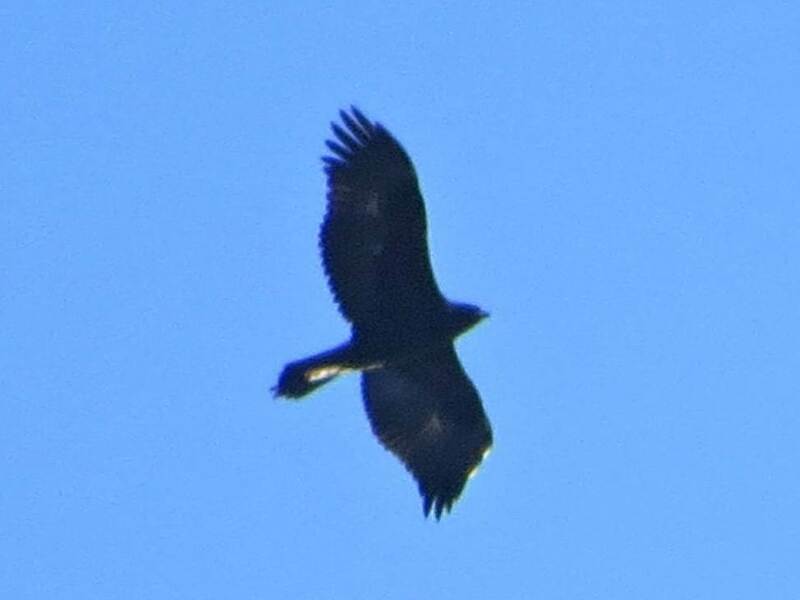 Shortly before the summit, we spied two raptors soaring over a far ridgeline. Our Prairie Falcons? 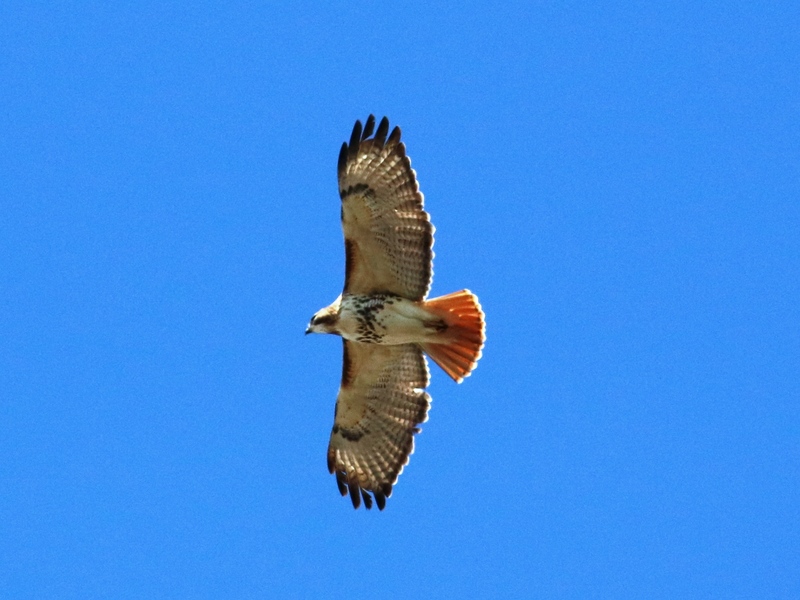 Perhaps, based on their pale coloring, but more likely Red-tailed Hawks. 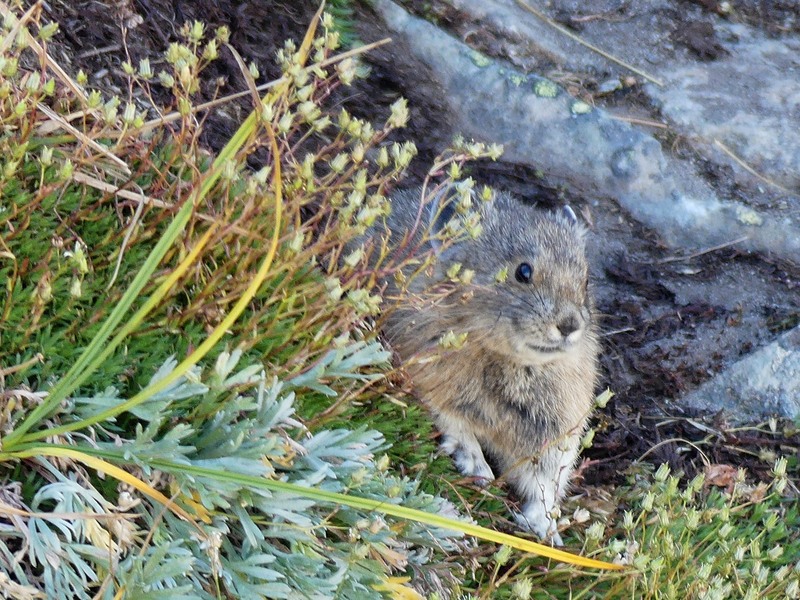 Alas, we saw no ptarmigans either, but we did see Mountain Goats and a cute Pika. And we did conquer Mt. Fremont! Pikas are cute little mammals most closely related to rabbits. We persevered to reach the Mt. Fremont Lookout. The next morning was serendipity, as we drove park roads before breakfast looking for another Rutkin life bird, Sooty Grouse, or at least a Ruffed Grouse. Nothing along the roads, so we headed toward a trail at Sunrise Point as our last best chance. Not 50 yards in, I spied a bird walking down the trail. 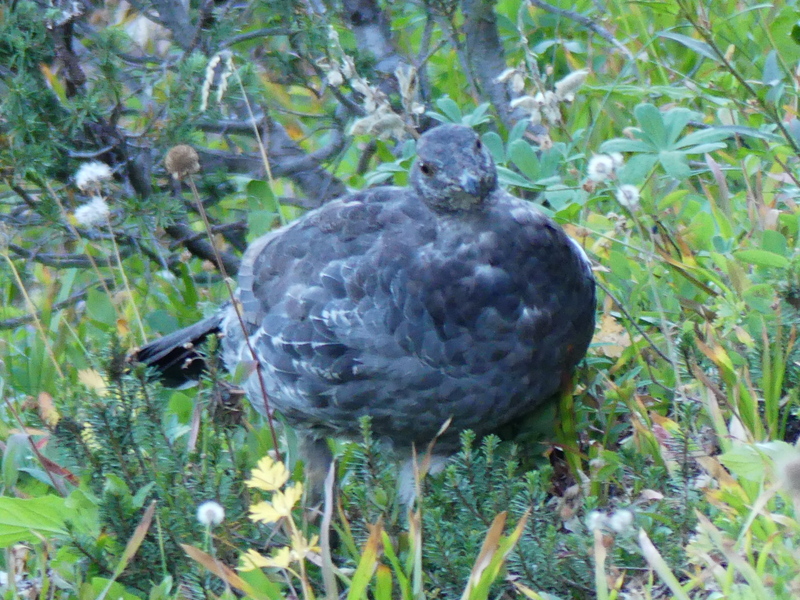 “Shelley, there’s your grouse!” We snapped dozens of photos as the male Sooty foraged in the trailside vegetation. Shelley’s Sooty Grouse lifer poses for our cameras. Our morning wasn’t done. A mile down the mountain, I jammed on the brakes as two woodpeckers moved through the trees – American Three-toed Woodpeckers. 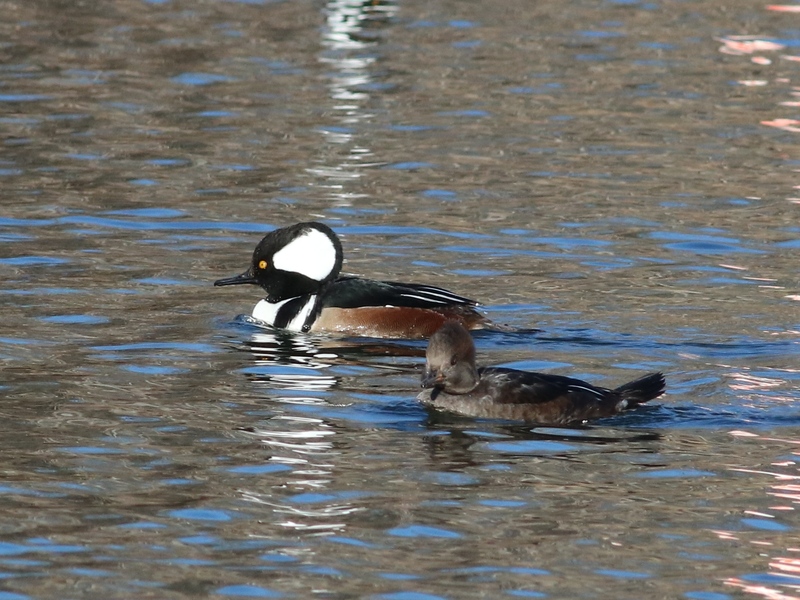 We both had seen only one previously in our birding lives, but these were the first in Washington. 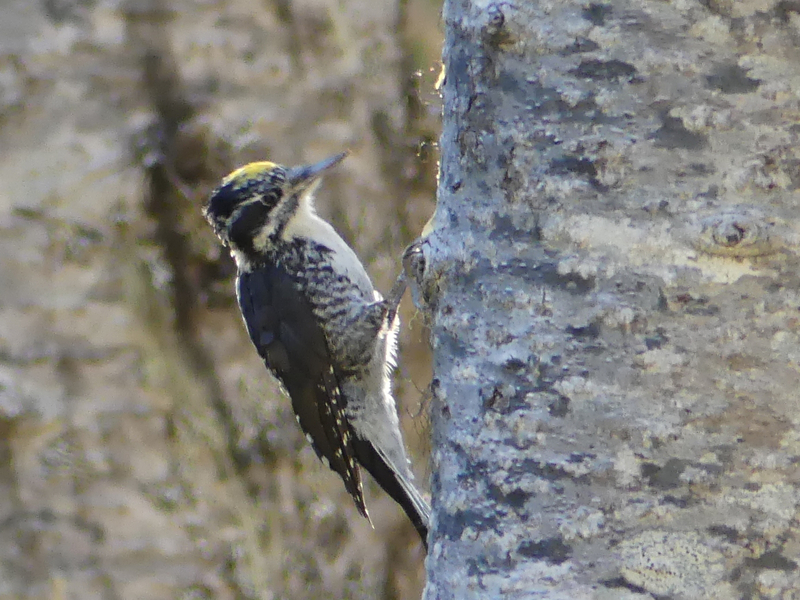 Shelley was able to get this photo of an American Three-toed Woodpecker. Mt. 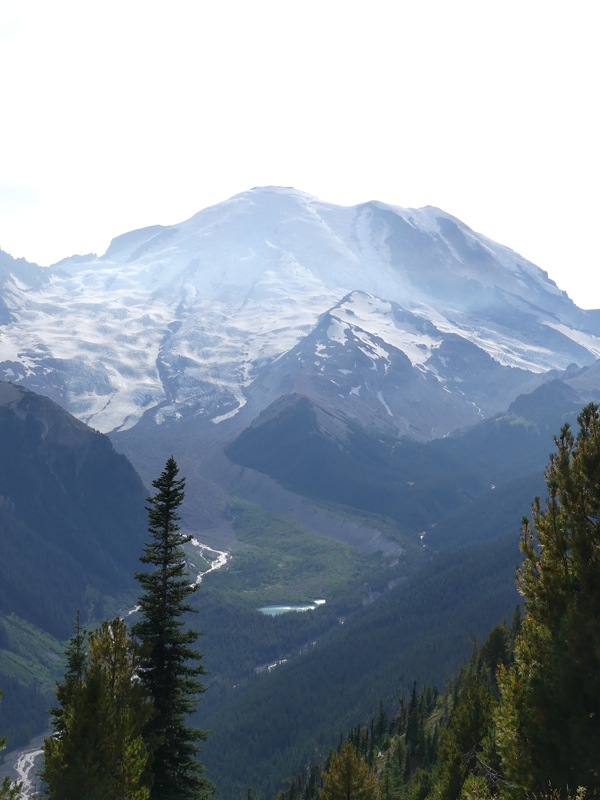 Rainier was all it has been touted to be. Many wildflowers had passed their peak, but the meadow at Sunrise still was full of Pasque Flower, Newberry’s Knotweed, Cascade Asters and Magenta Paintbrush. Shadow and Sunrise Lakes reflected light from the valleys below. And always, Emmons and Winthrop Glaciers on the mountain glistened in the background. We also lucked out with the clear skies. A few days later, the smoke had moved in and Crystal Mountain was being evacuated. 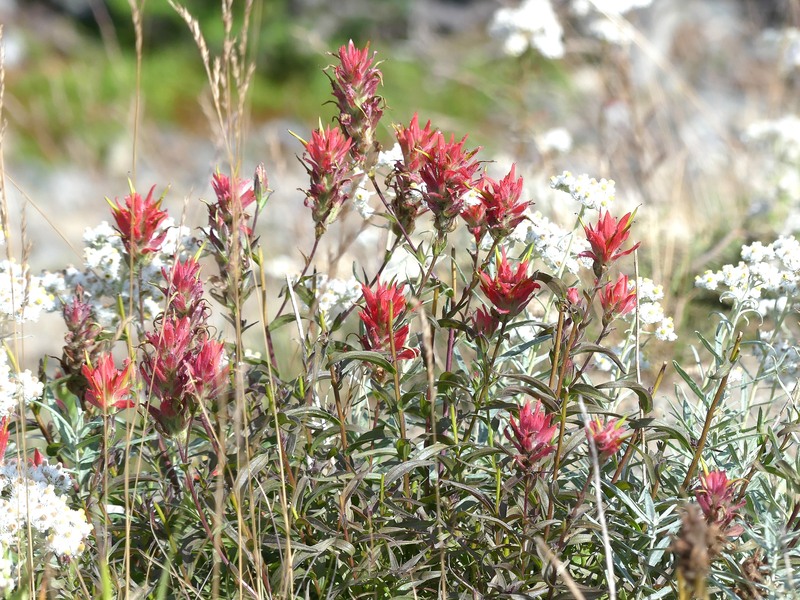 Magenta Paintbrush was still in bloom on Sunrise Meadow. 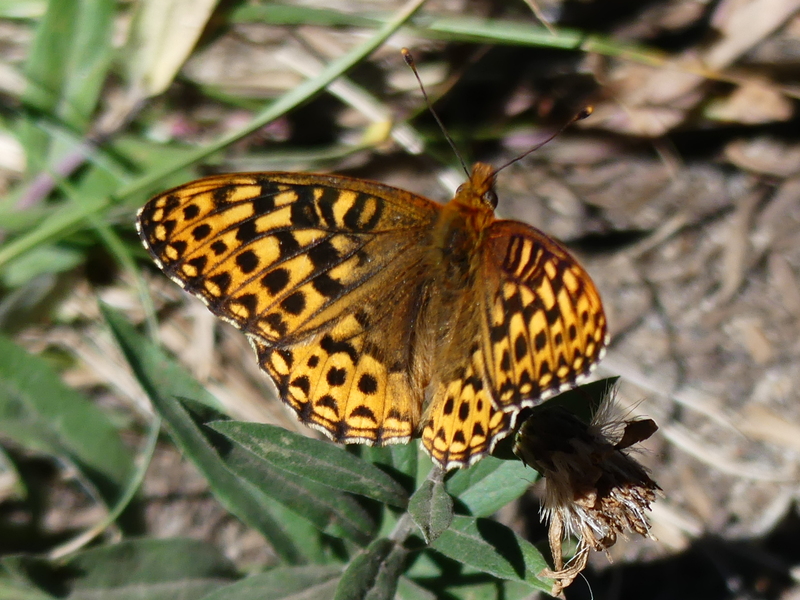 Butterlies were surprisingly scarce, but this Hydaspe Fritillary was a beauty. The first morning at Sunrise, we had encountered a birding acquaintance. 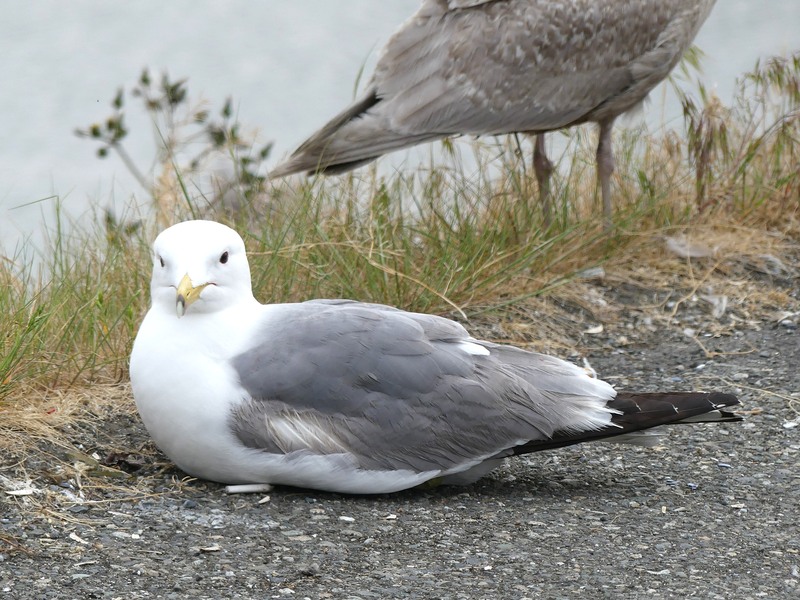 She alerted us that Ryan Merrill, our area eBird reviewer, had found a Swallow-tailed Gull at a North Seattle park on Puget Sound. I had seen this species in its native Galapagos Islands off of South America, but “Wow!” The only two previous sightings in North America were in California. People on the east coast already were booking flights. Nathan Gatto texted that in our position he would check out early and head to the coast. We had demurred with fingers crossed that it would stick around. 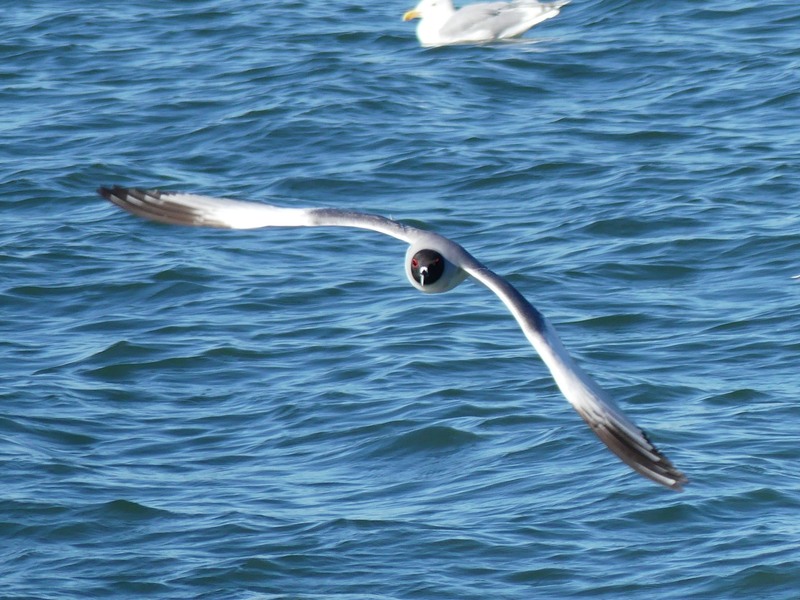 This Swallow-tailed Gull is only the third one reported in North America. But would it? The next day, when we were grousing, the gull had disappeared. We headed home as other birders searched the Seattle area waterfront. Joy! Mid-afternoon, it was located a bit to the north – on a refinery pier at the southern tip of my home Snohomish County. However, viewing access was limited, treacherous and likely illegal, across railroad tracks. We also were caught in brutal Friday holiday traffic. We would have to wait. On Saturday morning, no Swallow-tailed Gull at the Seattle park, the refinery, or even along Edmonds beaches a mile to the north. The search was on again. We decided to go to Edmonds, anyway, while we awaited any news. 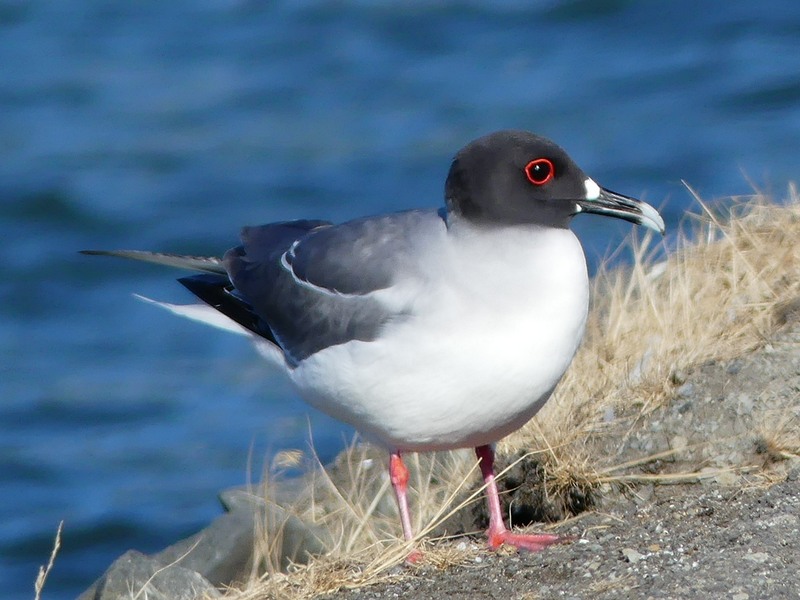 The Swallow-tailed Gull may be the most beautiful gull in the world, but the gray-feathered, red-billed Heerman’s Gull belongs in the pageant and Shelley had seen few of this western species. There were dozens roosting along the Edmonds jetty. Dozens of Heerman’s Gulls roost on the Jetty at the Edmonds Pier. Still no word in the afternoon, so it was off to the Everett Sewage lagoons to look at Western Sandpipers and an assortment of ducks, including Cinnamon Teal. The water now was too high to add an uncommon Willet to my county list at Tulalip Bay, so we headed over to Everett’s Marine Park. At least there, Shelley could add California Gull and Ring-billed Gull to her Washington list. 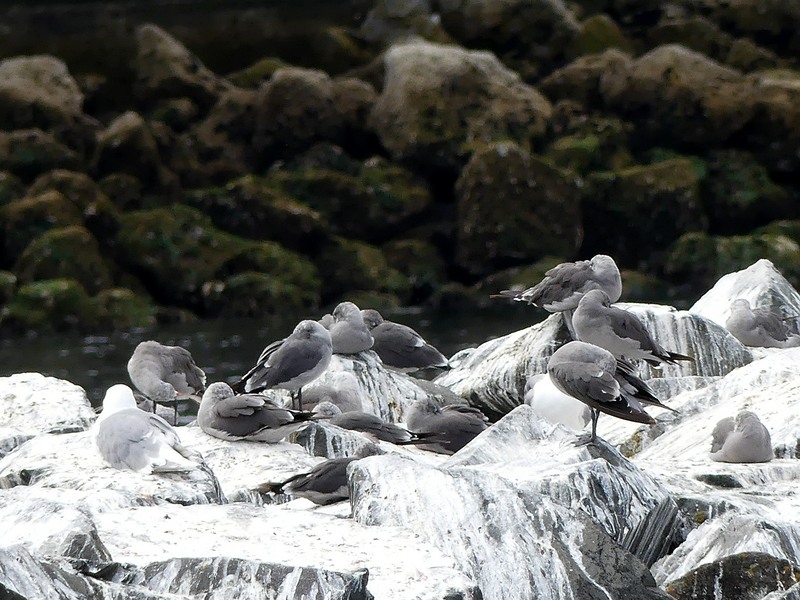 The Swallow-tailed Gull seems to enjoy the company of California Gulls. Sitting in the water with Californias just a few yards from the parking lot was a smaller gull with a chocolate-brown head, a bright red eye ring, black wing tips and a two-toned bill of black and silver with a prominent white spot at its base. And, when it fluttered, we saw red legs and a u-shaped tail. We had relocated the Swallow-tailed Gull about 15 miles north of where it was last seen. Gorgeous! The Swallow-tailed Gull takes a brief flight in Everett. Soon after we posted word on our local Tweeters listserv and on Facebook, other birders began to arrive. Suddenly, the gull hopped out of the water onto the edge of the parking lot not 20 feet away. Cameras clicked away from close range capturing this remarkably photogenic bird until it eventually returned to the water. The young man next to me turned out to be Amar Ayyash from Chicago and one of our foremost gull experts. 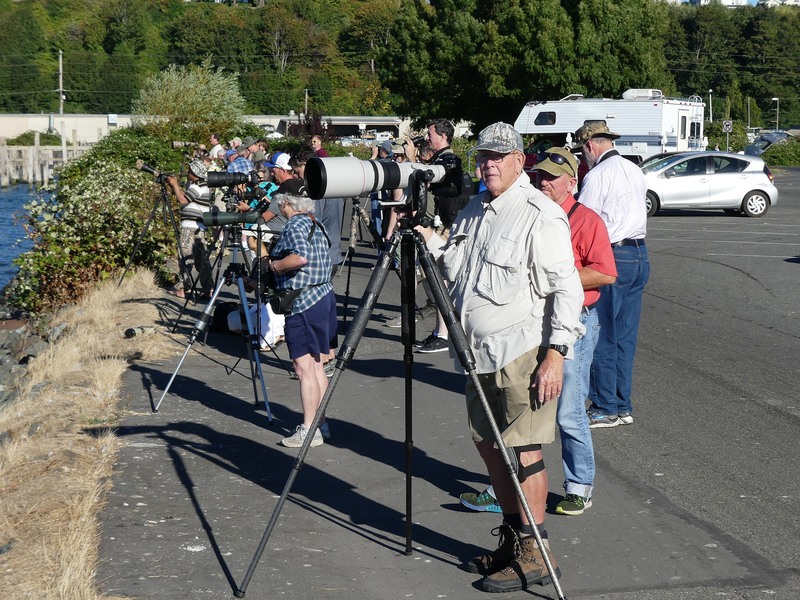 Instantly, we had street creds in the birding community in Snohomish County and nationally. What an amazing end to the day! Dozens of birders responded to our gull alert. Needless to say, the next three days were anticlimactic. We canceled a planned return east of the mountains because of the smoke and continuing heat. Instead, we stayed around home and added birds to Shelley’s state list. 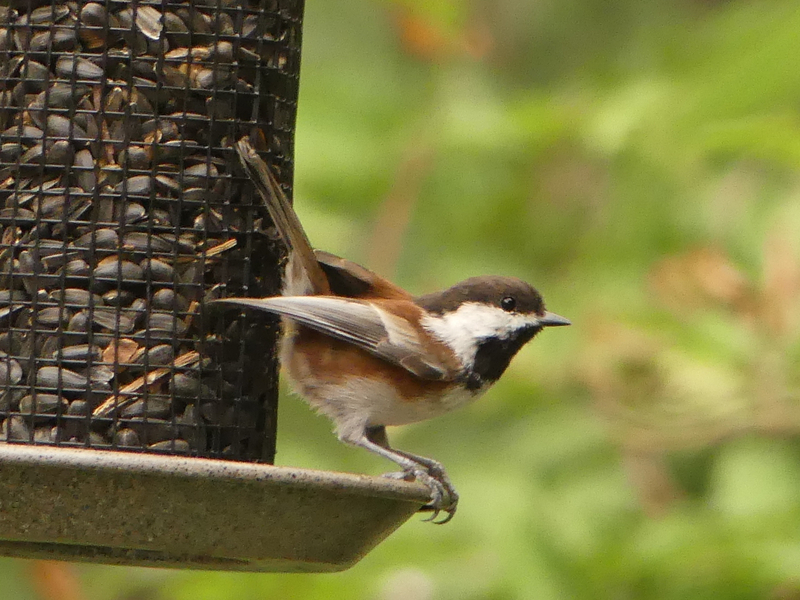 Shelley really wanted to see a Chestnut-backed Chickadee, and she captured one with this photo. Chestnut-backed Chickadees and Red-breasted Nuthatches visited feeders at a local park. Both yellowlegs and Short-billed Dowitchers foraged on Skagit County mudflats. Black-bellied Plovers and Caspian Terns rested on a sandy spit. Ospreys and Great Blue Herons fed their chicks at Marine Park. And, our adventure together ended with a Marbled Murrelet and Mew Gull at a nearby beach. 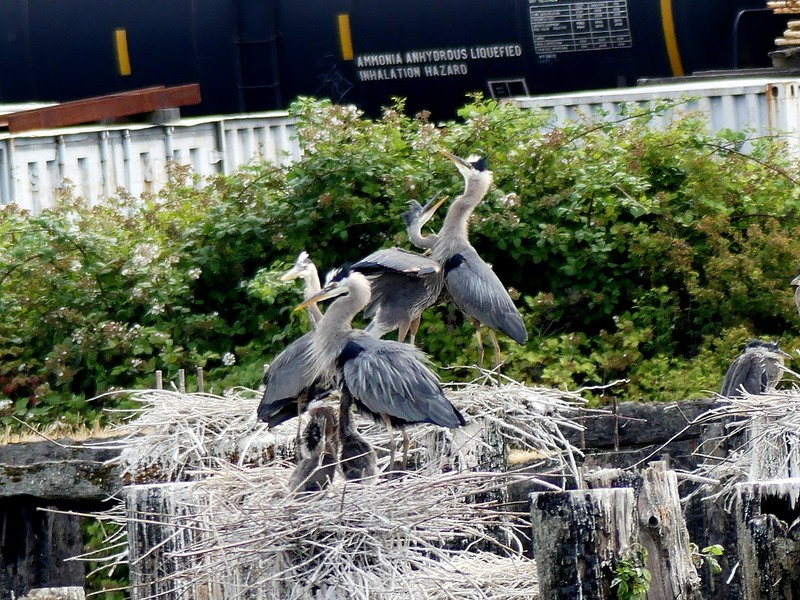 The Great Blue Heron rookery was still busy at Marine Park. The mountain scenery was beautiful, the Swallow-tailed Gull was amazing, and Shelley’s state bird list now stands at 81. However, just as nice was taking it all in with a long-time friend. Mary, Shelley and I walked the Silver Forest Trail at Mt. Rainier. Addendum: More than a week later, the Swallow-tailed Gull is still here. So long as the squid are easy to find each night and Seattle’s infamous rain holds off, it just may be here awhile. 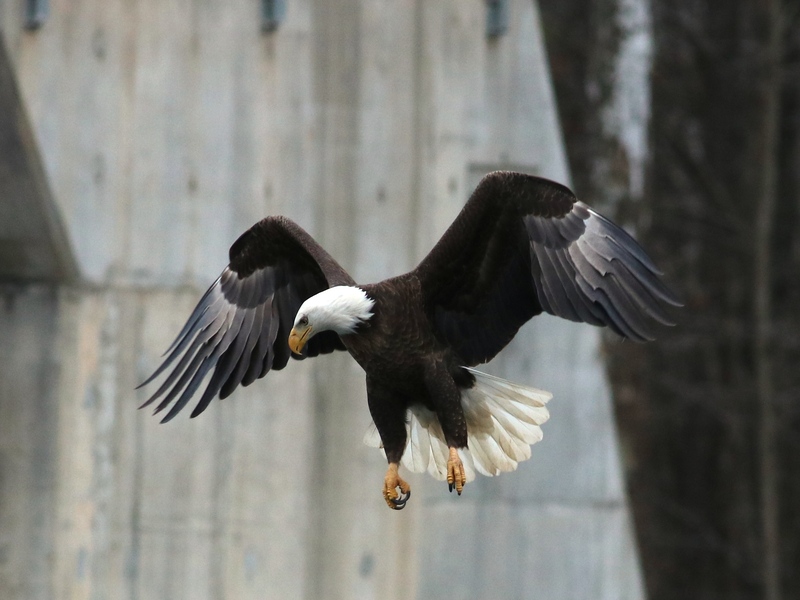 Birders love surprises and 2015 was full of them. Adding to last year’s fun was our Forsyth County 2015 Photo Big Year. Surprises included birds rare to Forsyth County, birds rarely photographed, and birds rarely photographed so beautifully. 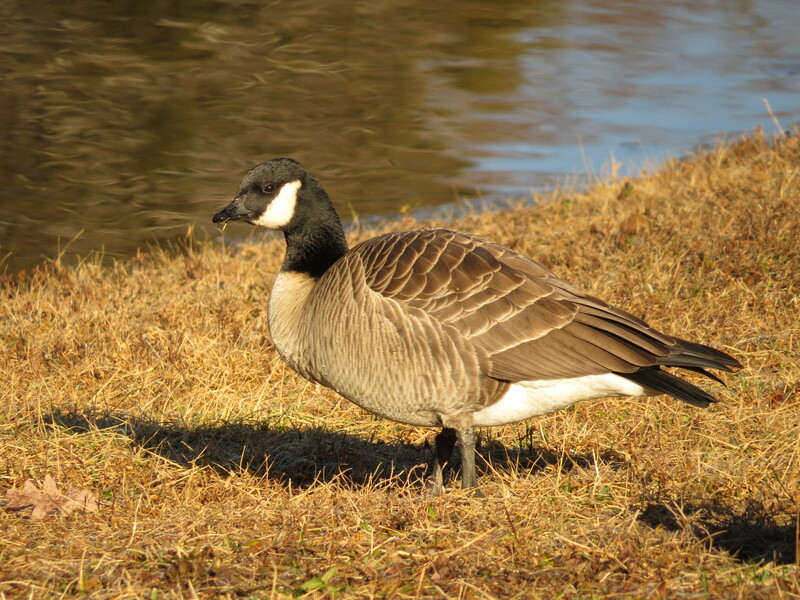 The rare birds started on New Year’s Day with this Cackling Goose photographed by Susan Disher at Cornerstone Living Center ponds, on Reynolds Park Road near Salem Lake Road. 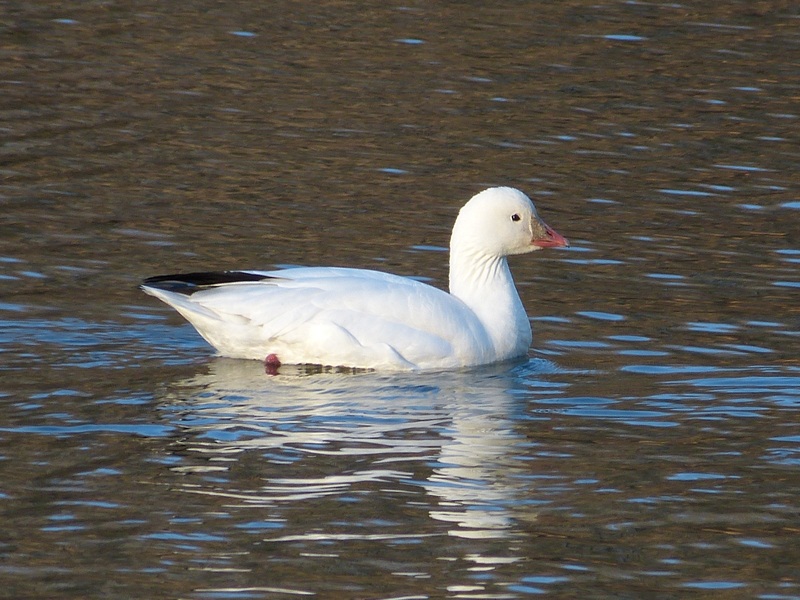 Another rare goose quickly followed, a Ross’s Goose at Lake Hills in Pfafftown on January 5. Here is my photo of that bird. 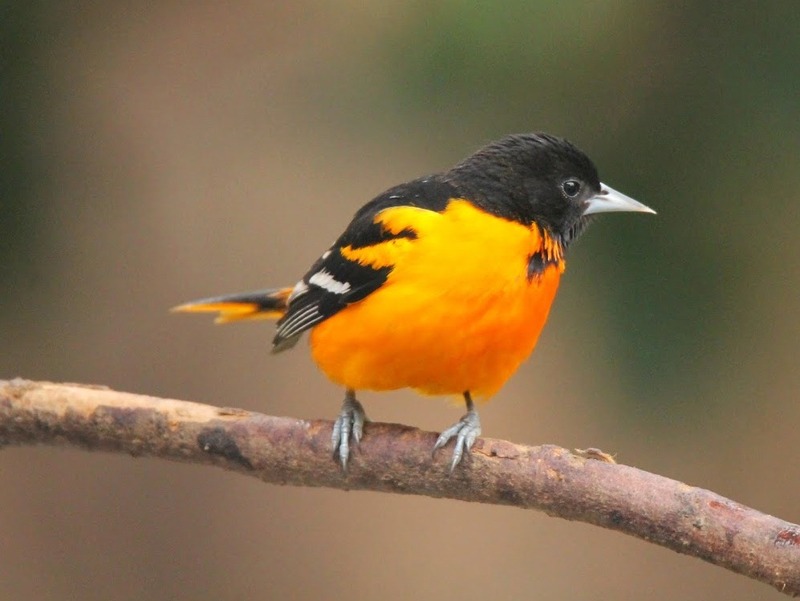 Wayne Petel was one of the lucky few who had wintering Baltimore Orioles at his feeders. His photo of this gorgeous male is one of my favorite photos of the year, taken on January 12. Rare waterfowl continued with a Surf Scoter found and photographed at Swann Water Treatment Plant in Lewisville by Mike Conway on January 24. This is only the fourth county record. The Swann Plant hosted another rare bird the following month, a Red-throated Loon found and photographed by Nathan Gatto on February 18. The loon was also the fourth county record. An Eastern Screech Owl photographed by Matt Cuda on February 23 in northern Forsyth County was a surprise of another kind. 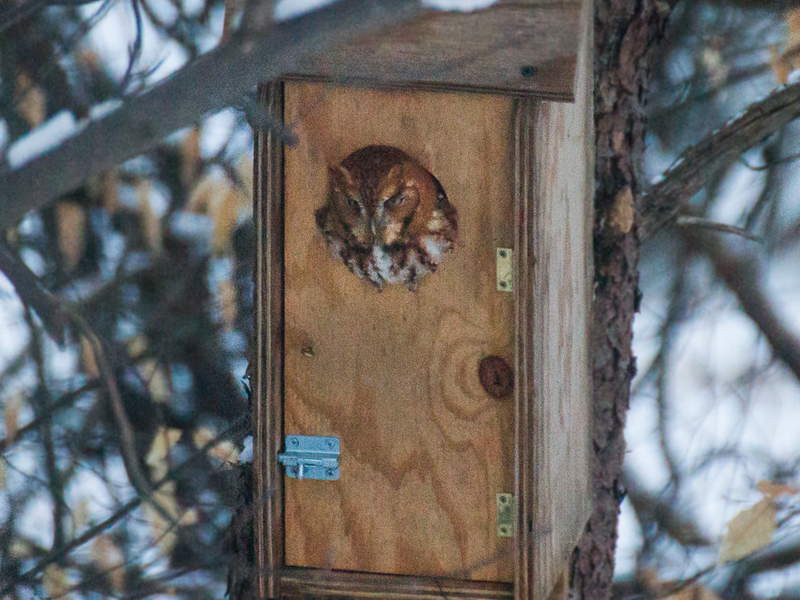 Screech Owls are resident breeding birds here, but I never expected that we would get a photo of one. 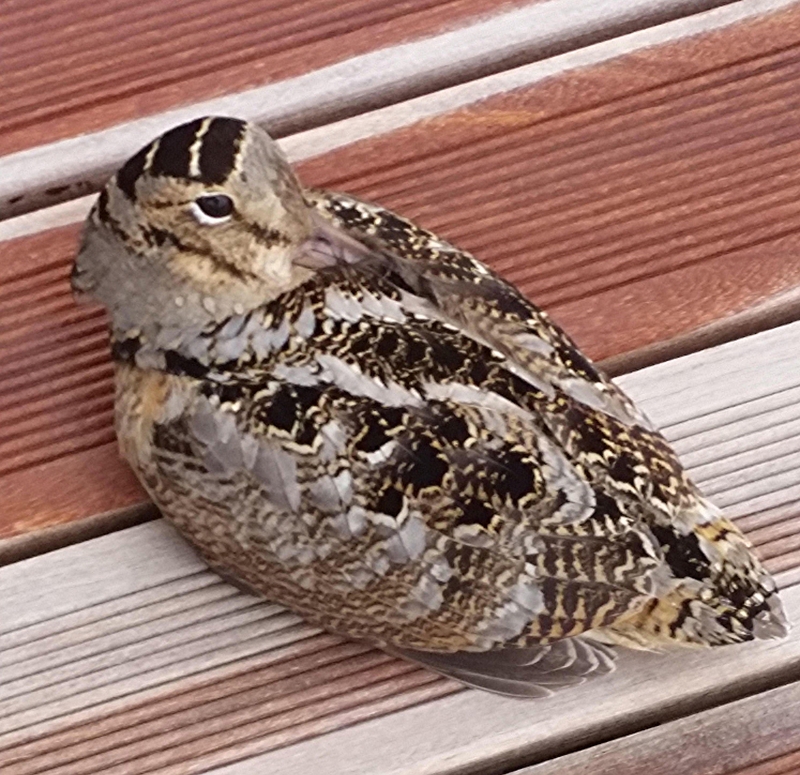 On March 25, we were surprised with a photo of an American Woodcock, another common bird, but one extremely difficult to photograph. This bird was apparently the victim of a window crash and was photographed by Lesa Dowell on the roof of a downtown Winston-Salem office building. Fortunately, the bird seemed to recover and was able to fly away. While rarities are fun, the Photo Big Year helped us get many wonderful photos of our common birds. 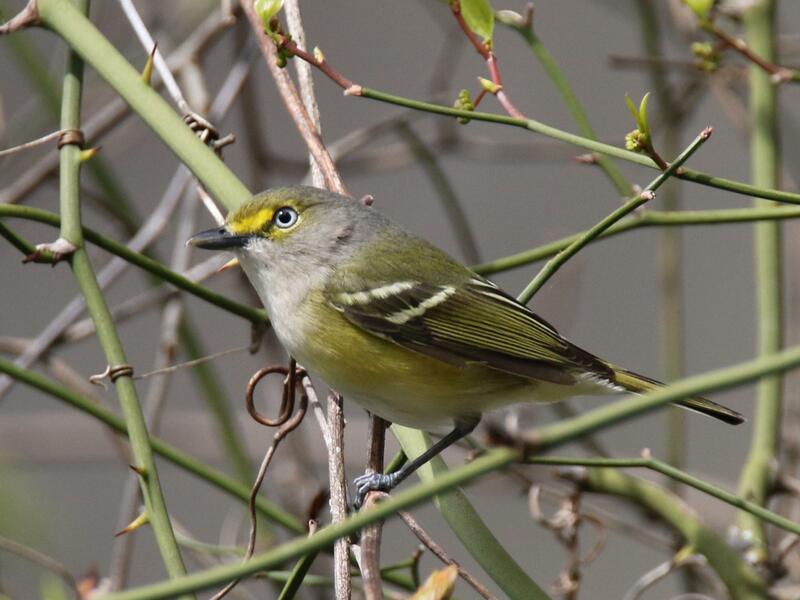 Leesa Goodson shot this photo of a White-eyed Vireo at Tanglewood on April 5. It wouldn’t be spring without warblers and we got photos of most of them. 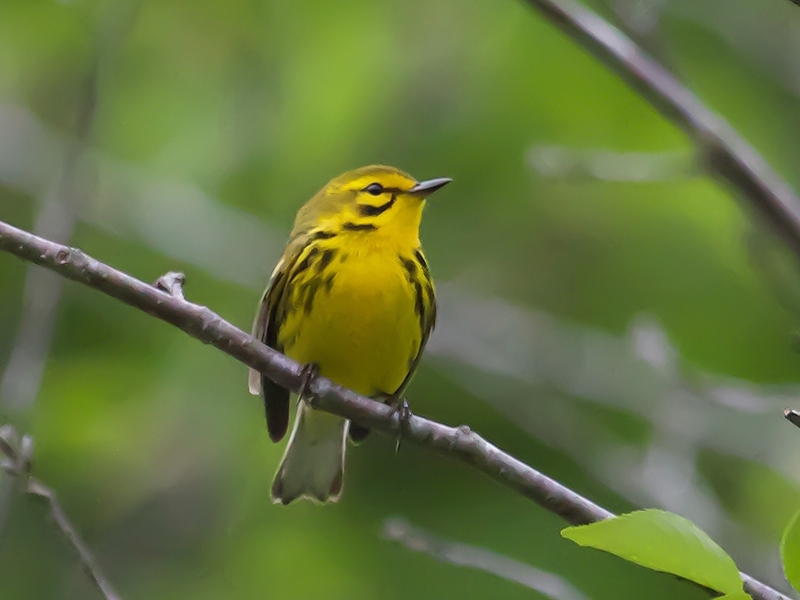 Here is Nathan Gatto’s lovely Prairie Warbler, photographed at Reynolda on April 25. 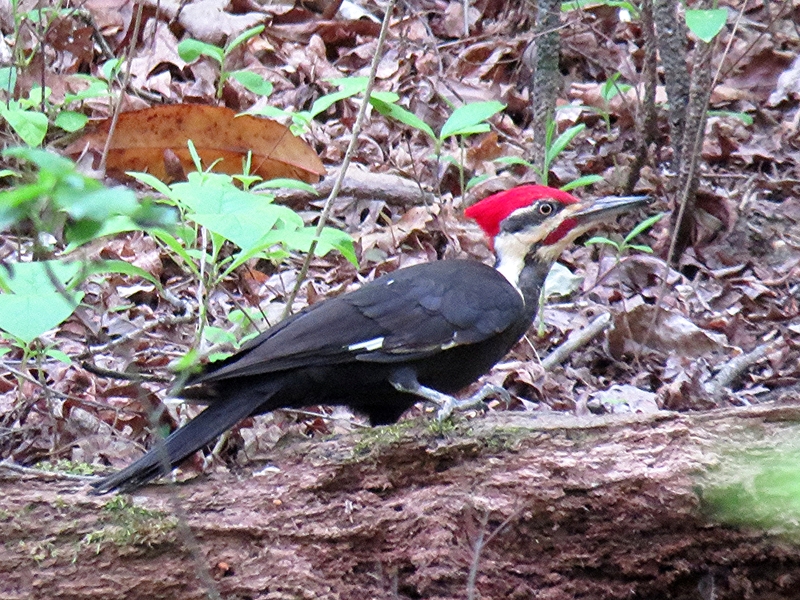 Another favorite was Heather Moir’s Pileated Woodpecker, also photographed at Reynolda, on April 30. On July 13, Jean Aldrich found an Anhinga flying over Bethabara Parkway near the former Johanne’s Restaurant ponds. This was the first report of Anhinga in the county. No photo was taken, so the bird was added to our official Forsyth County bird list in a provisional status. 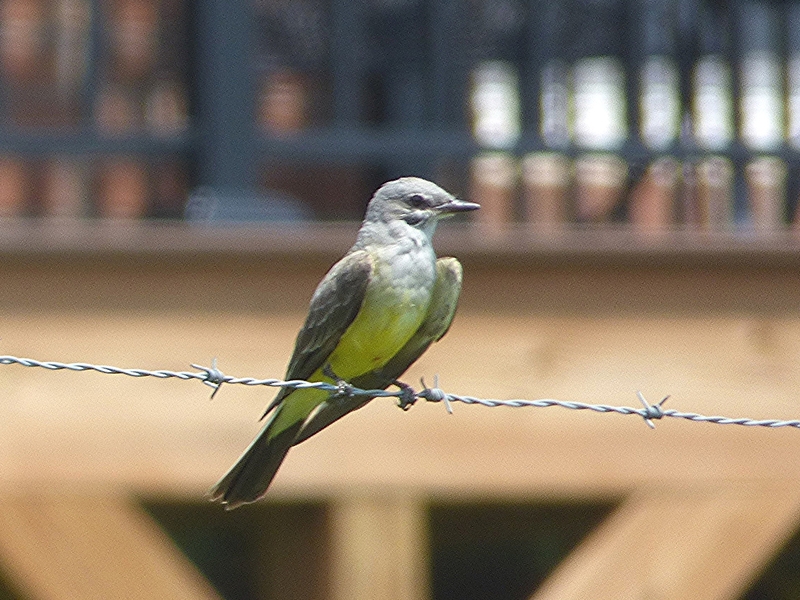 The next big surprise of the year occurred on August 14 when Cynthia Donaldson found the first Western Kingbird ever reported in Forsyth County. 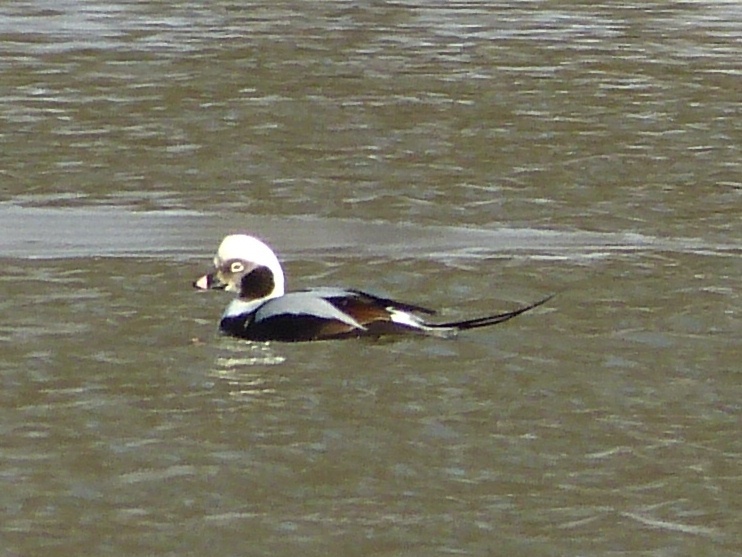 The normal range for this bird is Western North America, just as its name suggests. They do wander a bit in the fall, showing up mostly along the coast, but there are very few records for inland North Carolina. Here is Cynthia’s photo taken on Kapp Road in Pfafftown. 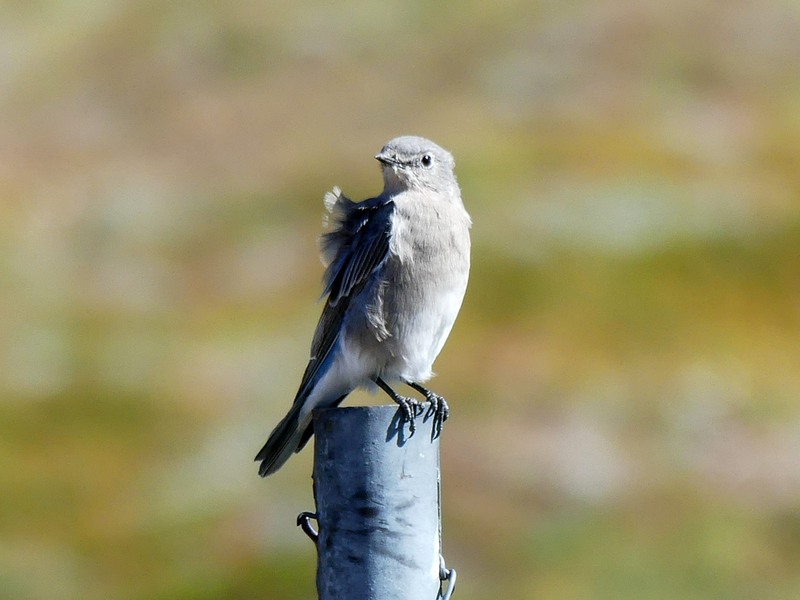 The kingbird was followed by another unusual sighting just a few days later on August 20, a Baird’s Sandpiper found by David Disher at Archie Elledge. There are only a handful of county reports and this was the first since 2007. 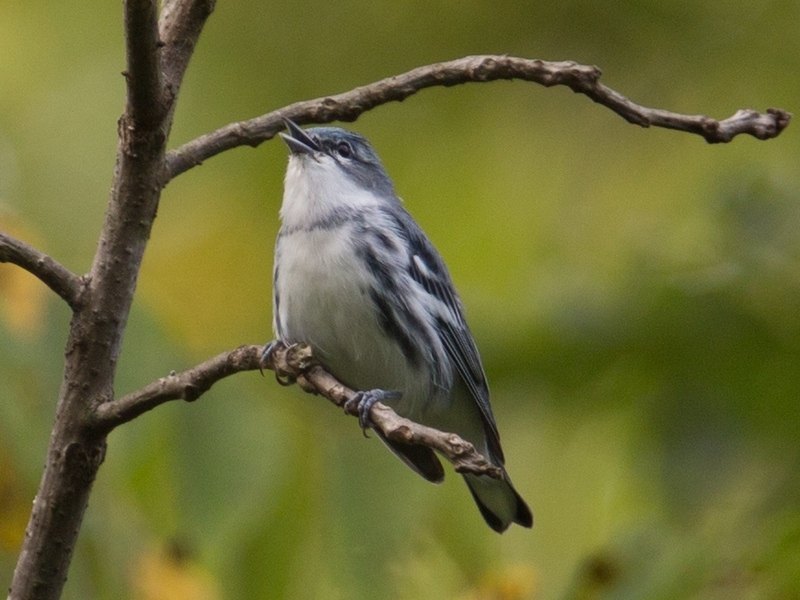 Exactly one week later, on August 27, Hop Hopkins found a Cerulean Warbler at Bethabara Historic Park. This bird was unusual in that it stayed for several days allowing quite a few birders to see it. Hop got the beautiful photo below. On September 22, Kim Brand received a phone call from a friend, Mindy Conner, with a report of an unusual hummingbird in her Winston-Salem backyard. 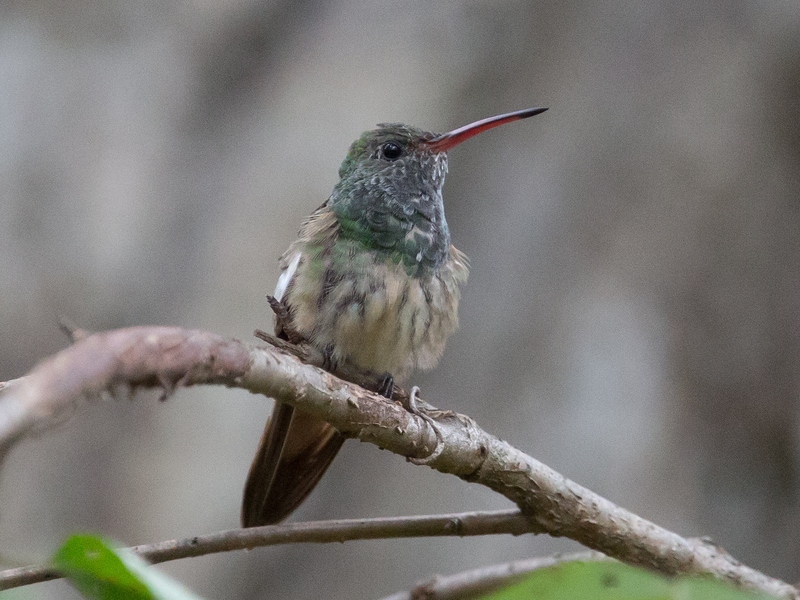 Later that day, the bird was identified as a Buff-bellied Hummingbird. This was what birders call a mega-rarity. It was not only a county record, but only the second time the bird has been seen in the state! Mindy welcomed birders to her yard and this jewel has been seen by hundreds of birders. Here is Hop Hopkins’ photo. 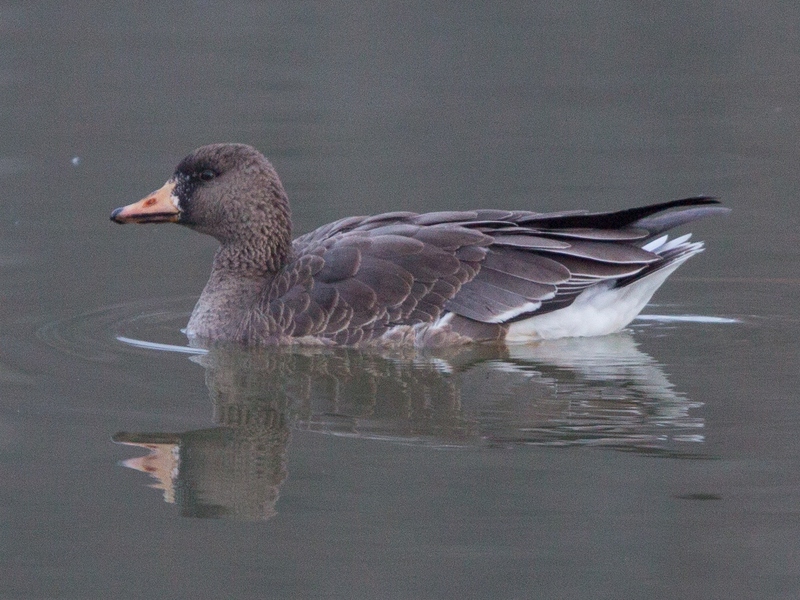 Fall waterfowl migration brings us back to Lake Hills, this time for a Greater White-fronted Goose, on November 6. This is only the fourth time this species has been reported in Forsyth County. David Disher’s photo is below. During the Forsyth Audubon Second Saturday bird walk on November 14 at Muddy Creek Greenway, we added another county record bird, Golden Eagle. The bird was initially identified as an immature Bald Eagle. But, new Audubon members Tony and Cara Woods were on the walk and Cara got a photo with enough detail to change the identification to Golden Eagle. Amazingly, this was the fourth county record for 2015. Another surprise for the year were two Northern Bobwhites that visited David and Susan Disher’s Winston-Salem yard. 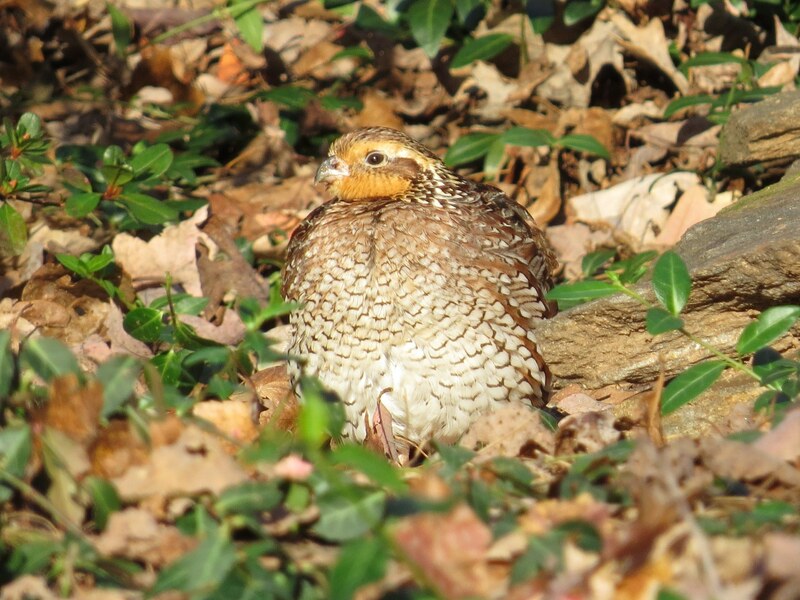 Bobwhite are becoming increasingly difficult to find in Forsyth County with only a few scattered reports. The Dishers’ visitors stayed for a couple of days. Here is Susan’s photo. Four Forsyth county records made 2015 an outstanding birding year. So many folks seeing those birds made it even more special. We are lucky to have a generous community of birders who love to share. That group spirit was exemplified by participation in our Photo Big Year. We published images of 193 species by 28 photographers. Thanks to everyone’s quick-thinking, skill and talent we were able to beautifully document our Forsyth County birds of 2015. Six people had over a dozen photos each that we used – Hop Hopkins, David Disher, Nathan Gatto, Leesa Goodson, Phil Dickinson, and Wayne Petel. Every person who contributed made a difference, but these six folks deserve special recognition and thanks. See the Photo Big Year page for links to the species pages displaying all the images and photographers’ names, dates, and locations. 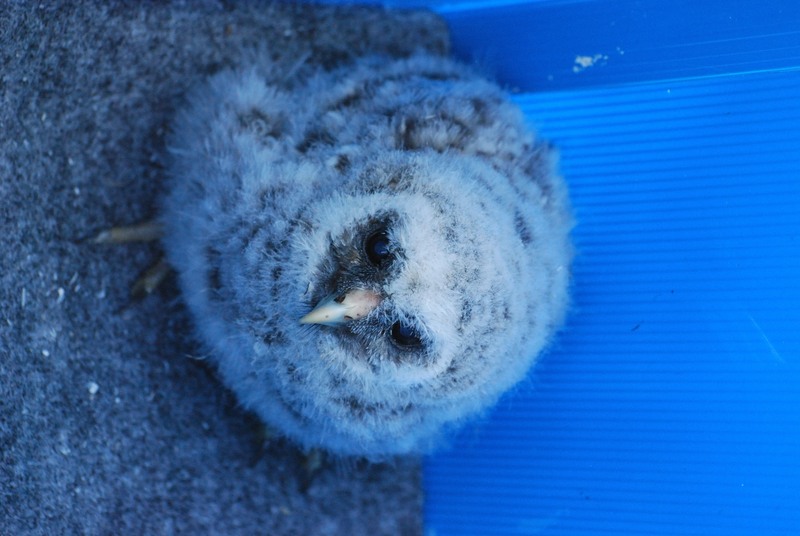 The little Barred Owl was only two weeks old. He was still covered in down and just beginning to get pin feathers. The owlet shared a nest with his siblings in a cavity about 30 feet high in a big old tree at Tanglewood County Park. The nest was very nice with a solid floor and lots of room. But there was a little low spot in the front wall which allowed the owlet to fall out of the nest. 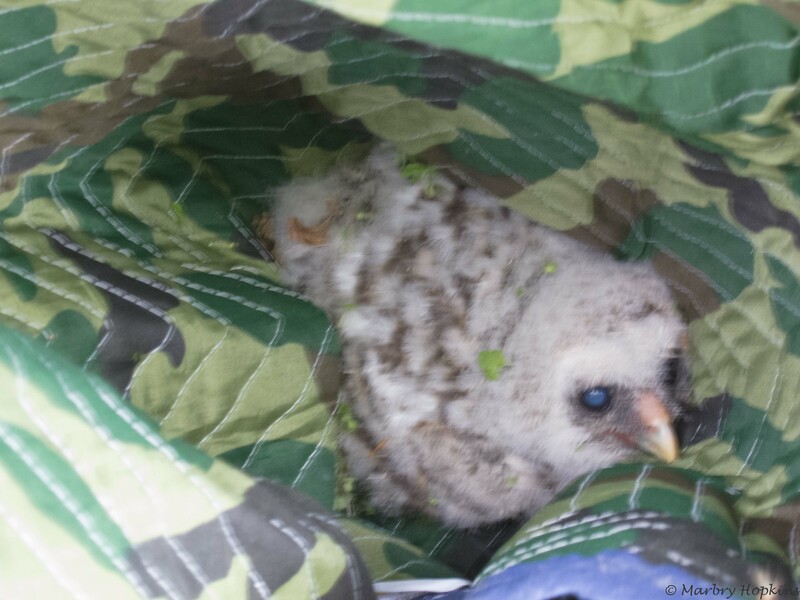 The Barred Owlet was found on the ground. Photo by Hop Hopkins. Fortunately, a birder spied the owl on the ground near the trail. Hop Hopkins and David and Susan Disher were walking along the trail and ran into the first birder who showed them the owl. Hop contacted Phil Dickinson who knew just what to do – call Jean Chamberlain. Jean is a licensed raptor rehabilitator who has performed many owl rescues. Hop scooped up the owl and put it into a REI shopping bag with a small blanket. He took it to Animal Ark Veterinary Hospital in Clemmons where Jean picked it up. In the REI bag for transport to Animal Ark Veterinary Hospital. Photo by Hop Hopkins. Jean took the owlet home and carefully examined it. It weighed 325 grams (11.5 ounces) and was healthy and uninjured, so Jean began forming a plan to re-nest the owl the next day. She contacted Lorena Greene, whose husband, Aaron, works at Tanglewood. Aaron and his friend, John Ledbetter, also a Tanglewood employee, were happy to help. They agreed to meet Jean with a ladder and help put the owl back in the nest. Jean allowed Phil Dickinson and me to go along and observe. On Wednesday afternoon, April 23, Aaron and Lorena, John, Jean, Phil, and I met at Skilpot Lake. But our rescue party was not yet quite complete. The young owl calmly waiting in the parking lot. Photo by Phil Dickinson. Todd and Beth Cassidy had just rescued a Great Horned Owl and needed to deliver it to Jean, so they also met her at Skilpot Lake. It was their 26th anniversary and Beth said that they always like to have an adventure to celebrate. So, Todd and Beth joined our Barred Owl party and we all went back to the nest area. 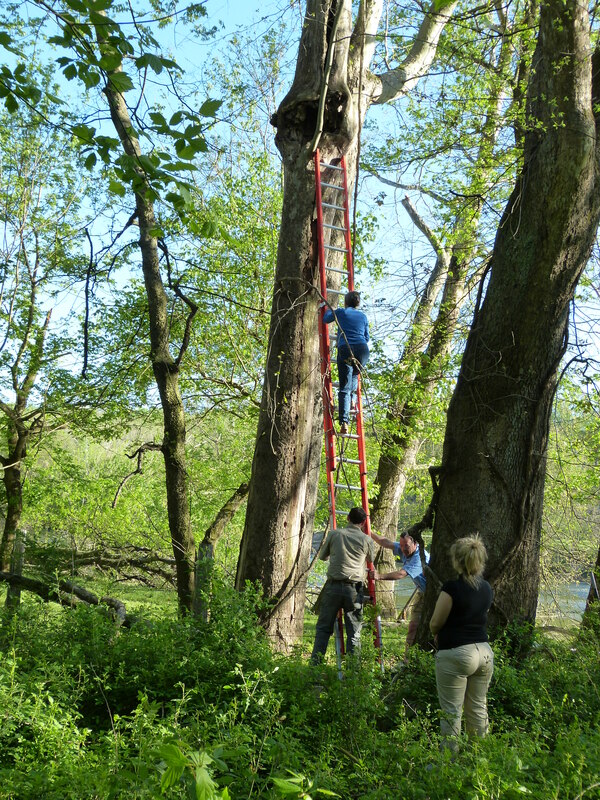 The men quickly set up the twenty-foot ladder and leaned it against the nest tree. As we’d suspected, it was not nearly long enough. Aaron called another friend for help and we soon had a 40-foot ladder. This one was just right. Jean climbing up to the nest. Photo by Shelley Rutkin. Jean quickly ascended the ladder and inspected the nest. She came down and reported that it was really nice and that it contained two owlets. Had the nest been in need of repair, she was prepared to reinforce the bottom. She got her camera and the owl and went back up. Jean placed the little owl in the nest and came down the ladder again. Success! Jean had re-nested the owlet. 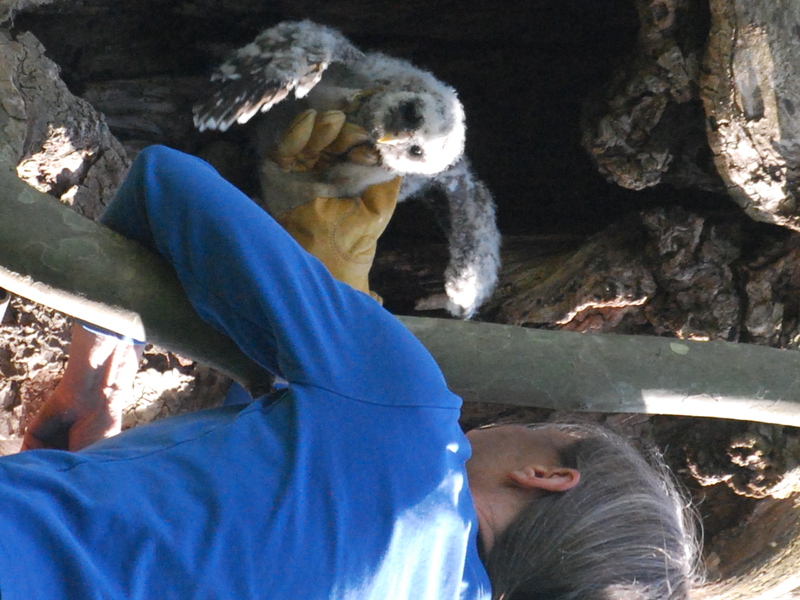 Jean placing the owlet back into the nest. Photo by Phil Dickinson. Our little owl back in the nest with his siblings. Photo by Jean Chamberlain. 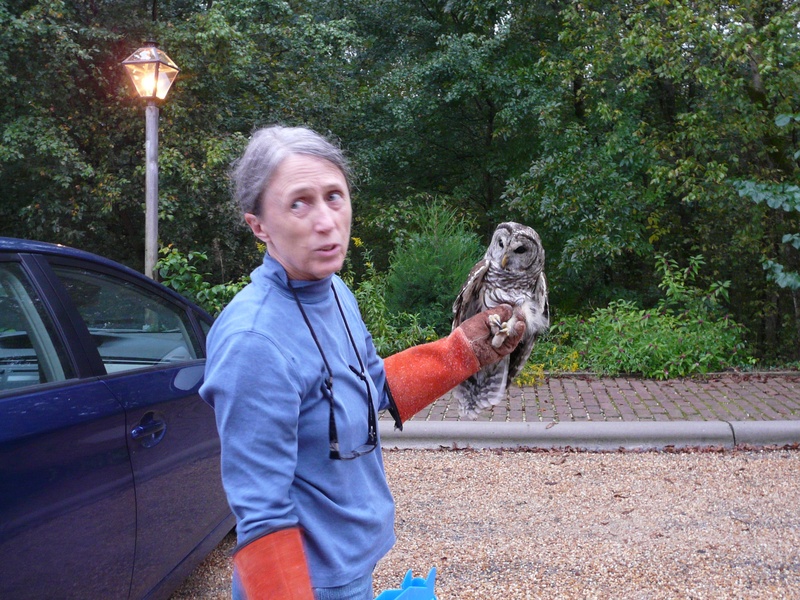 Jean is our local owl and hawk expert with Wildlife Rehab, Inc. She and several other people in this story are Forsyth Audubon members. 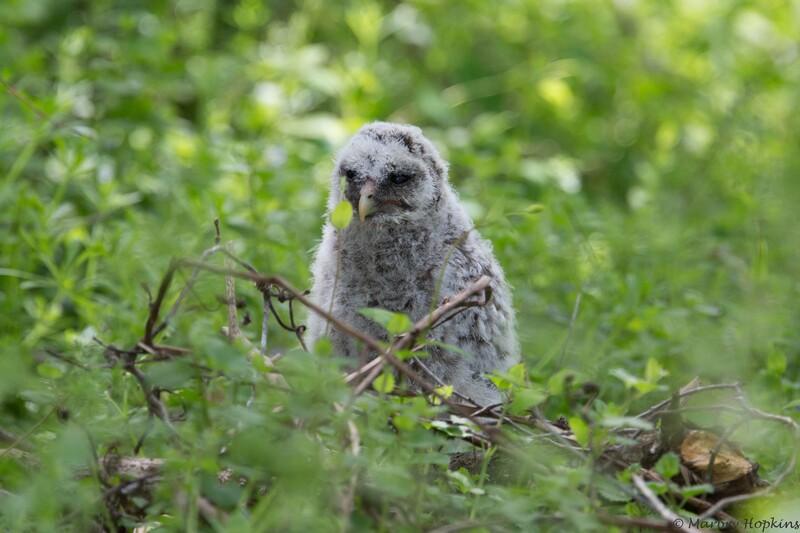 I have referred to the owlet as “he”, but there is no way to determine the gender of a young owl. Please be especially careful to avoid disturbance of the owls during the next few months. The babies will soon be “branchers” out of the nest. They will be unable to fly and are safer from predators in the branches of the tree than on the ground. 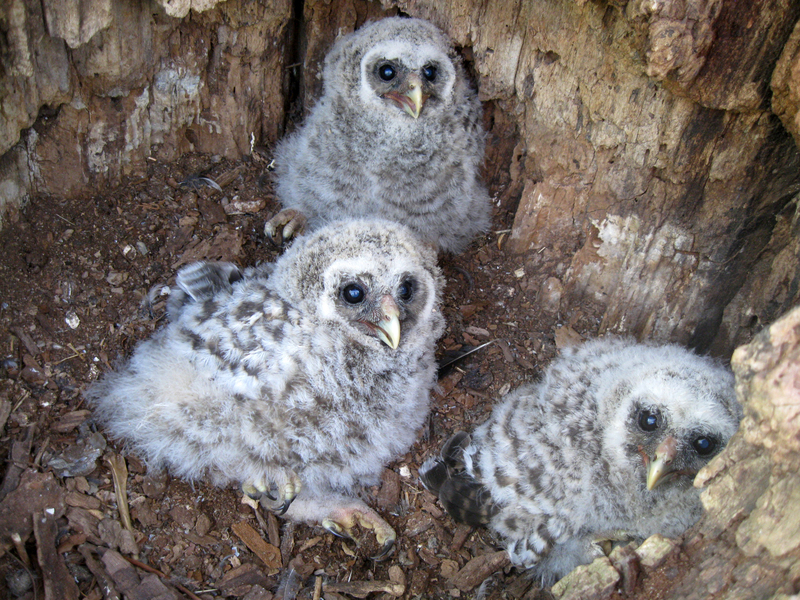 The parents will continue to feed the young owls for several months. Fall is a tough time of year for young owls. Their parents have recently stopped feeding and caring for them, but they have not had sufficient time or experience to hone their survival skills. So, mistakes happen – like crashing through windows. Karen Keller, Town Clerk for the Town of Bethania, arrived at her office this morning and opened the door leading into the Alpha Chapel as usual. 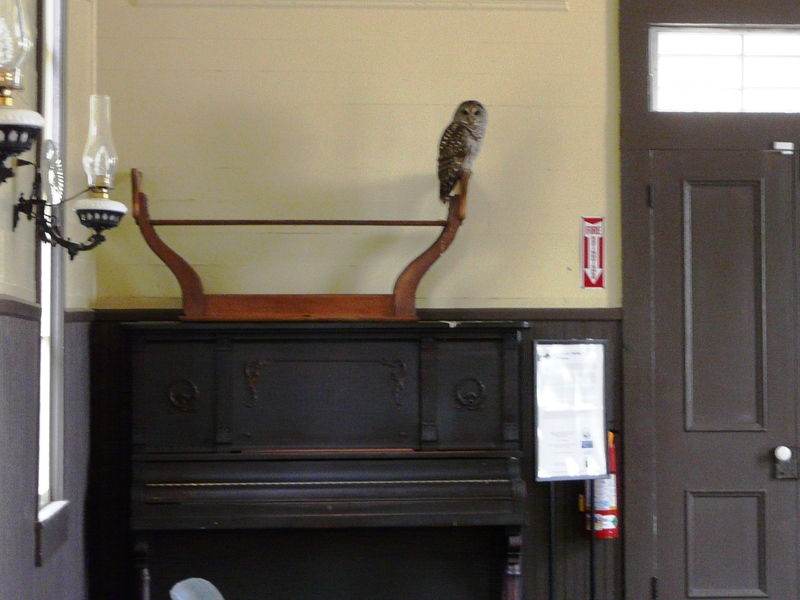 Imagine Karen’s surprise when she saw shattered glass on the floor and a Barred Owl on the piano. Karen called me and asked what to do. 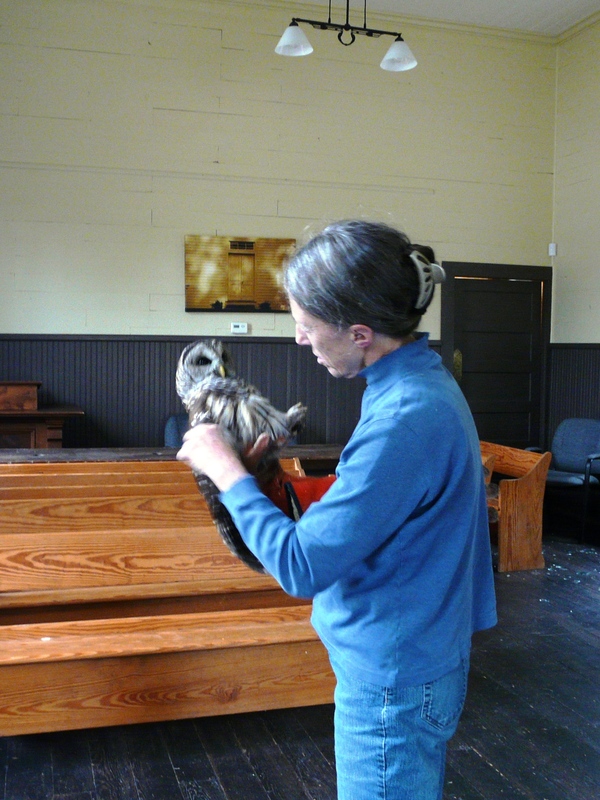 I called Jean Chamberlain, our local owl and hawk rehabilitation expert with Wildlife Rehab, Inc. Thirty minutes later, Jean, Karen, Mark Farnsworth (manager of the Bethania Visitor Center), and I walked into the chapel. The owl was still on the piano, but it quickly flew around a little and then crashed into a corner and fell to the floor where Jean was able to pick it up. Jean showed us the barring on the owl’s wing which indicated that it is a first year bird, probably about six months old. Although there was no evidence of bleeding and we had just seen the owl fly, Jean carefully examined it for injuries. Something in the tendon that runs along the top of the wing felt not quite right, so Jean decided to take the owl home with her for observation. I was elated to receive a phone call a few hours later saying that the owl was flying just fine. Jean also said that feeling its keel revealed a healthy amount of muscle, so the bird had been successfully feeding itself. There was a little swelling in its wing, but she expected that it would heal naturally. Jean planned to release the owl at 6:45 PM this evening. We arrived in the Bethania Visitor Center parking lot at the agreed upon time and Jean took the owl out of its carrier. We admired the owl again and then Jean swept her arm upwards and let go. The owl quickly flew to the nearest tree, sat for a minute, and then flew out of our sight. This beautiful young owl was now back home in the wonderful woods of Black Walnut Bottoms. 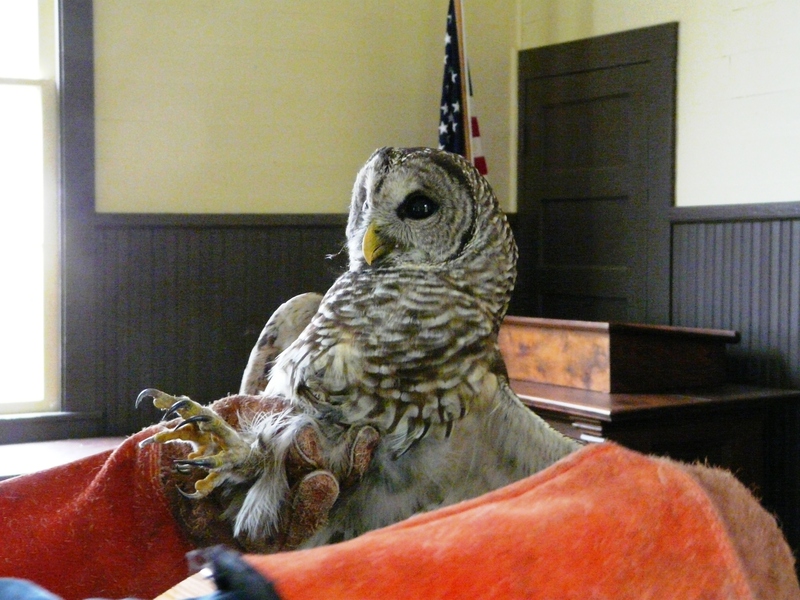 Female Barred Owls are larger than males. This bird was intermediate in weight, so we do not know its gender. The photo below shows the view from outside the chapel. 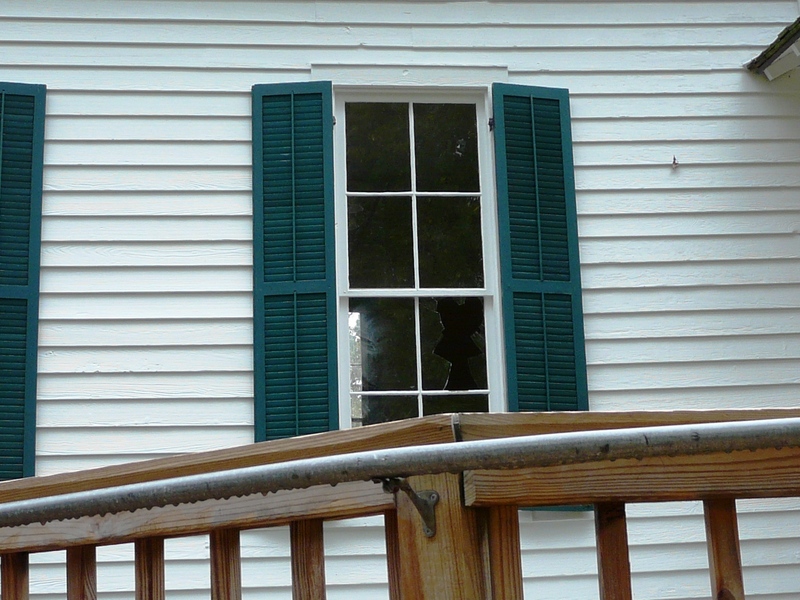 Note the lower right window pane where the owl crashed through. In addition to facilitating owl rescues, Forsyth Audubon works with the Town of Bethania to replace non-native invasive plants with native species. Our other activities include bird and butterfly walks in Walnut Bottoms. See the Bethania page on our website for more information. Forsyth Audubon has a brand new blog. We’ll use this space to write about all kinds of things – bird friendly backyards, hawk watch, Lights Out, trip reports, and more. Do you have ideas for what you’d like to see here? Or, would you like to write a guest post? Email any of the authors listed on the “Contact Us” page. We hope you enjoy reading our blog.